I need some help from the vets of the 417th. My wife's uncle PFC Thomas E. Ryan was killed in action 6 Feb 45. As far as I can determine he was killed during a night assault across the Sauer River.I am trying to discover if he was in Alpha, Bravo or Charlie Companies 1st Battalion 417th Infantry Regiment Any iformation on him would be appreciated. Most of his records were destroyed by fire in 1973. All of his brothers and sisters are dead. His sister-in-law is still alive and in her 90s. She stiil talks about seeing him off in early 1944 at the Dearborn Train Station in Chicago. She handed him his favorite treat, a peanut butter and jelly sandwich, waved goodbye and never saw him again.He was 19 years old when he left and was dead by age 20 in Europe.I know a long time has passed but it would finally bring closure after 58 years to a 90 year old woman. My name is Lawrence J. Selegue. I was a member of the 76th Div. 417 Bn, Co F. 4th platoon. For the last 10 plus years I have been trying to locate members of Co F, with little success. I am interested in locating the following:: Sgt James Bear,(Wounded at Zeitz) Robert Bella ( From Chicago Illinois) Paul Klocke (From Wisc. or Minnesota) Paul Heim (Home Town Unknown). Are you able to assist me in my search, or can you offer any suggestions. Thanks. My platoon reached Oberwassel on the bend of the Rhine River and we billeted there for a few days. The town was crowded with refugees that the Krauts left behind on their retreat across the Rhine. On a moonless night I was on a 4 man patrol to hook up with our troops in St. Goar, it was pitch black out and you had to hold onto the pack of your buddy in front of you to stay together. Dogs were forever barking giving our position away. Loud foot steps from the road were heard approaching us. We stopped and when they got close enough we challenged the unknown individual. The person stopped, then the foot steps began again running away from us. With our rifles on our hips we opened fire in the direction of the foot steps. I myself fired 4 rounds. I don't think we hit him. We reported the incident and the barking dogs. The next day we were ordered to shoot all dogs on sight. Another incident that stands out in my mind. My platoon was dug in on high ground in the woods in the Sauer River area. The woods were so thick that you could only see perhaps 20 to 30 yards in the prone position, standing you saw nothing. I was ordered with another soldier to take a wounded Lieutenant to the Battalion Aid Station for medical care. He was shot in the foot. With the Lieutenant's arms across our shoulder we started down the side of a small mountain to the Aid Station. Part way down bullets were swishing past my ears. A sniper was shooting at us. The 3 of us got down on our back sides and slid the rest of the way down. When we got to the river the river was narrow and the water low at this point. We managed to cross by moving from rock to rock. Part way across I was in the water up to my knees. My boots were full and my feet soaked. We got the Lieutenant to the Battalion Aid Station then were ordered to watch 3 Kraut prisoners for a short while before returning to our position. Another incident that is fairly clear in my mind. After crossing the Rhine at St. Goar, we were on what was known as mopping up operations. We had the Krauts on the run. In passing through a number of farm towns (I don't remember their names) white sheets were hanging from many windows, there was little or no resistance from the enemy. Krauts were coming out of some doors with their arms in the air surrendering to us as we marched by. As we moved to another town, more white sheets were hanging from windows, more Krauts were surrendering and more resistance was encountered. Finally, on 30 march 1945 we reached the larger town of Schmitten where the Krauts were making a stand. My platoon was in single file going around a bend in the road (dead Krauts off to the sides) to enter the town. I could hear a lot of rifle and machine gun firing and shells exploding, etc. I did not think I would get into this battle because there were 2 platoons of troops in front of me. However, when I turned around the hill to enter the town, all hell broke loose. Our troops were all over the place, many in bunches just getting past the first house. Seeing this, I jumped into a ditch along side the road, observing the situation and waiting for the troops to disperse. (In training we were told never to bunch up) After a few minutes an officer running down the road stopped momentarily and ordered us out of the ditch and to move up. Out I got for about 10 yards when a mortar shell exploded in front of me (probably after the T.D.). There was a hail of fire in front of me which I could reach out and touch. Lying on the ground, I could hardly move. I managed to crawl back to the ditch to get out of the way, and there I stayed (moving in and out of consciousness) until I was taken to the rear by our medics. My Father, Sgt. Rollin E. Allen was a member of the 417th Inf. Reg. Company B. He was wounded and captured outside of Trier, Germany. I think the date was March 1945. Members of the Companies A, B, C were taken POW that day. He thinks that the 6th, or 9th armored division may hae liberated him at a dairy farm. He is not sure where in Germany. I am still getting information from him at this time. He is almost 89 years old. He is trying to remember things so I can write them down. If you can help me with information, It would really be helpful. Hope you can use the enclosed material for your project. Lots of luck and success on your endeavor. Hello, My name is Daphne(Barnes)Houze and I am the daughter of then private John E. Barnes who served in the 417th infantry regiment. I don't know much about my father's participation in the war but have been trying to research it because I have a collection of his millitary things. I know he received a purple heart and a bronze star for wounds and actions while in the 417th between 15-21, Feb. 1945. I know he had a lower leg and possibly chest wound and according to a family member was hospitalized in France and was still in the hospital when his mother died (of consumption) Mother's Day of that year. Sadly, my dad was an intensely private, stoic man who rarely spoke of his injuries or his experiences and he passed away of congestive heart failure in 1972 and I was only 10 years old. Many years went by and my mother gave me his things several years ago. I did not know what I was looking at and when I finally started to ask for records I have gotten only a little information and it has been a painstakingly slow process. I am continuing to search and am grateful to have found Gerald Brown and Lt.Col. Hamilton to help me interpret some of the things that I have! I would love to hear from anyone who may have served with him! He was in L. Co. In addition to his medals, I have some photos, badges and personal items that he kept and would be happy to show them to anyone who may have served with him and has an interest. My great uncle T/Sgt. Moe Kazyck was killed February 7, 1945 during the crossing of the Sauer River. Our family, at the time, made a great effort to find more about the circumstances of his death and about his last days. Very little was forthcoming. According to the War Department, he was found dead of shrapnel wounds to the throat. In 1947 his body was disinterred and reburied in New York with a military funeral. We do have his purple heart. We know little else. Anyone who knew him or of him would be great to learn more about him and the 417th in general. 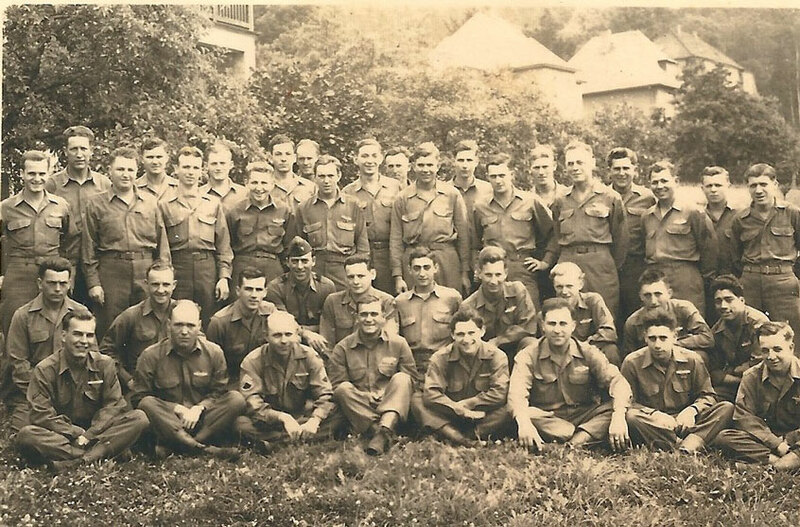 I am writing to see if anyone can give me information about my father & the period he spent as a member of Company G, 417th Infantry, 76th Division in WWII. My father's name was John J. Kopera & he was from Hastings, PA. He was a T/5 & served in the Army from 1943-1946. My father died in 1971 of a heart attack. He was a secondary school teacher in Gaithersburg, MD at the time. Because of this (I was 7 at the time) I have no first hand accounts of my Dad in WWII. 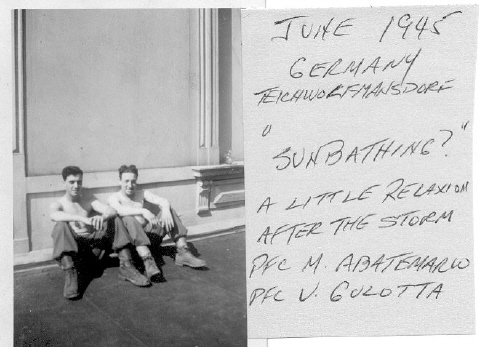 I've attached a few photos that I have of my father in training stateside & then in Germany in 1945. I can't identify the men that are in the photos with my father. I'd appreciate any information. I am looking for anyone in the 417th who might have known Verlon M. Horton. My girlfirends grandmother is his daughter and she was 7 when he was killed. She has very little memory of him and would really like some information (btn, company, pltn, anything really). Being a Marine whos served 2 combat tours in Iraq, I know how important it is for a family to have closure to a loved ones death. Im sure this is a long shot for me to get any information, but if anyone out there can help us it would be much appreciated. Thank you for your help, and thank you for your service. To the webmaster: Please include my email address with the post. Thanks for your time! Gerald: I served in Compay M, 3rd Battalion, 417th Regiment. 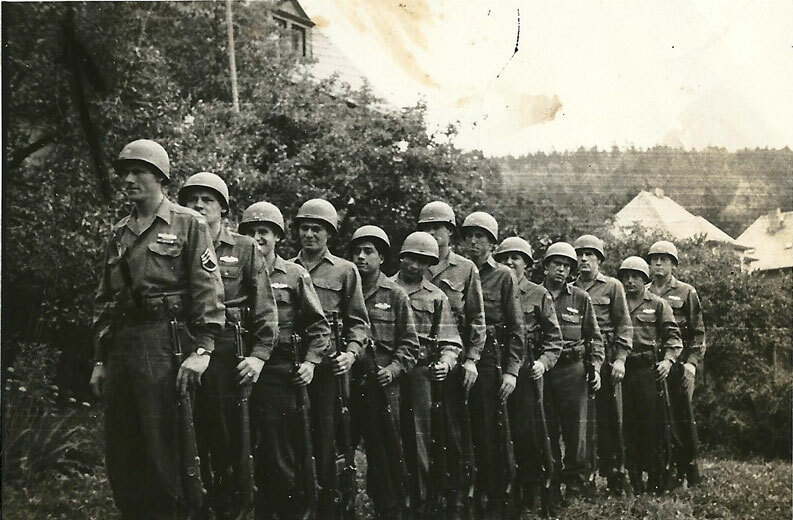 I joined the Divison at Camp McCoy in Wisconsin in the late summer/fall of 1944. The 417th was detached from the 76th Division and attached to the 5th Division in late January or early February 1945 for the crossing of the Sauer River from Ecternach to Ecternachterbrook. The Regiment suffered large losses in the river crossing. The river was at flood stage due to warmer weather melting the snow pack. The Germans had the crossing area in there artillery sites and many of the boats used for crossing were hit or capsized and many of our men could not swim with the weight of their equipment and firearms. Although the crossings were attempted at night the Germans seemed to have the crossing area zeroed in. Those that made it across the river the 1st night ran into mine fields just across the river and many were killed or wounded there. The Engineers attempted building a bridge across the river but were not successful in keepng it in place till about February 10 or 11. Some supplies were air dropped to us, but often the were in an open area under view of the Germans also making difficult to retrieve. The Germans did have good crackers and canned cheese which we availed ourselves to, after we routed them from their pill boxes and other fortifications. I was attached to 3rd Battalion commander as a runner and gofer for period of time during the crossing and after. The 5th Division crossed up river while the 417th Regiment was crossing into the heavily fortified hills across the Sauer River from Ecternach, Luxumborg. Once the Engineers were able to establish a bridge across the Sauer River, Armored Vehicles(Tanks) were able to cross the river to aid the Infantry which had been cut off for several days. Gerald, this enough for now, contact me if you would care to. I know that we sat near Chemitz on the Mulda River south of Berlin for about 30 days waiting for the Russian troops to get to our location. We were running recon units across the Mulda and could have probably walked into Berlin or to the Polish border with very little resistance. Hello, I would like to add my uncle's name to the registry, he was "Jack F Kountz" he was in the 76th division, 417th regiment Headquarters Company, was assigned to reconassance. My name is Terry L. Glusko, Sr. from Springfield, Massachusetts. I am not certain if you can assist me or not. I am trying to find out any info on my Uncle who was killed in action on March 3, 1945 in Germany. His rank and name was Sgt. 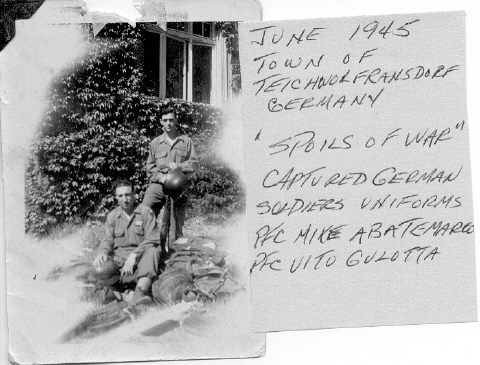 Victor Glusco, Serial # 13022595 and his unit assignment was Company "E",417th Infantry Regiment, 76th Division. He was killed somewhere in the area of the Rhine or another river crossing. I received some info from the U.S. Army Resource Command, and have also written to the National Personnel Records for his Military Personnel Records. Is it possible that you could post on you webside an inquiry to see if there is anyone out there who may have known him. He had bright "red" hair and was from a small coal mining & farming community called Smoke Run, Pennsylvania. Thank you so much for reading this. I volunteered for the army at the age of 17. Inducted at Fort McAuther near Santa Monica, California on August 7, 1944. Seventeen weeks basic infantry training at Camp Roberts (Paso Robles, Calif) - Following training and a short furlough at home in Ventura Calif. reported to Fort Mead, Md. for over seas shipment. Five day trip from coast to coast on a regular passanger train (Chair car). Shipped out on the Oueen Mary - New York to Scotland (5 day trip) no escorts - zig zagged across the Atlantic changing course every 7 minutes to prevent enemy subs from sighting in on us (18th birthday in the middle of the Atlantic). Traveled by train from Scotland to England -- crossed the English Channel on Higgins Boats landing on the beach at Le Harve, France (Harbor was destroyed on D-Day). Traveled to Replacement Depot in Belgium by train (Box Cars). Did not like French people encountered enroute along the RR Tracks. (Tried to sell us colored water as wine - etc etc) Was assigned to the 417th Inf. Company I - about the end of February 1945. Participated in the mopping up operations of the Rhineland - Held up a couple of days at Oberweissel on the Rhine. 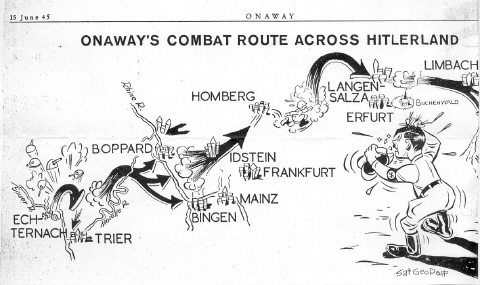 On day of allied crossings at other locations we watched from an elevated position above the river as our Combat Engineers constructed a pontoon Bridge across the Rhine under enemy fire, then we crossed that night on trucks being deposited a few miles east of the River in the middle of a moonless night. Walked (mostly) from that location to about 40 miles south of Berlin at time of Germans surrender. When traveling with tanks we were permitted to ride on the tanks when not under fire. A couple of times we were relocated to other sectors via truck. Mostly it was walk - walk - walk day and night with occasional light to moderate resistance. Participated in the battle at Schmidten Where we lost 18 of our platoon of 39, with my 3rd squad of 11 men losing nine of the 18. (One man had blisters on his feet and was riding with the kitchen). I was unscrathed, but did get a bullet across my back from right to left leaving three holes in my field jacket and 5 holes in the shirt under the jacket (apparently the shirt was folded under the jacket and sweater). G.I. issue knit sweater disintegrated and was discarded the next day. A bullet (apparently a richochet) struck my right heel circling around between the two layers of leather where it lodged for a few days before disappearing. (Apparently working its way back to the point of entry and falling out). Both shots knocked me down and both times I thought I was hit. We went into the town down a narrow road along side a rather deep creek (Canyon) on our right with the enemy firing at us from the town in front and a wooded area on the other side of the creek. The road was zeroed in with mortars and machine-gun fire. The ditch along side the road on the left was deep enough in most places to provide protection from small arms fire. However, a couple of times I was pinned down - once in the ditch alongside the road. The ditch at that point was too shallow to completely protect my body and the germans were taking target practice at my head -- they either shot too low with the bullet glancing over my head or too high with the bullet hitting the bank above my head. Again I was pinned down in the shallow ditch behind a burned out jeep. Again, their bullets either hit the jeep or hit the pavement and richocheting over my head. Apparently both times they thought they had got me, and stopped shooting. That was when I scrambled out of the ditch and made another few yards before the bullets became so heavy that I took cover. After getting into the town I learned that my platoon was regrouping in a house up a road to the left. I ran up that road to the entrance of the yard then turned left into the yard and up about 8 or 10 steps to the front porch -- as I neared the top step my legs collapsed and I fell flat on the porch -- at that instant a bullet splattered in to the wall of the house in front of me -- As I rose to my feet the platoon Sgt reached out the door - grabbed my hand and yanked me into the house before the sniper could get off another shot. Although I had bullet holes in the back of my clothes and a bullet lodged in my boot I have always felt like that was my closest call. We later learned that the town was defended by 200 German SS troops. The following morning we regrouped and moved east through the next small village where several of our tanks were knocked out and a few of the tankers were pinned down in a house and were really happy to see us. Several G.I. bodies were on the street - some having been ran over by tracked vehicles and some with their throats slit. The few Germans still in the town surrendered. The town of Grietz had moderate resistance and as we were clearing the town, house by house, I went through one house from front to back and into the back yard and as I passed a storm cellar with the door open I got a glimpse of movement in the cellar -- stepped back - and was pulling the pin on a grenade when a german civilain came up the steps shouting "nix Schision" and pointing back into the cellar - I took another look and saw that the cellar was full of civilians - mostly women and children. Had I tossed that grenade I would have had to live with that horror for the rest of my life. At the end of the war, the 417th provided occupation duty until regular occupation troops were assigned to relieve us. In August, I and several other young short timers were pulled out of the unit and sent home for a furlough then we were to be re-assigned to the Pacific -- While waiting in England for a ship the war ended in the Pacific. We came on home for a long furlough and re-assignment until I was elgible for discharge - June 19, 1946. Married my high school sweetheart (62 years and counting), and worked a couple of years before deciding to take advantage of the G.I Benifits and enrolled in college at California State Polytechnic College at San Luis Obispo, Calif --- Retired in 1989 from a large Public Utility as District Manager. We are now enjoying our life in a Retirement Community ajacent to a public golf course and visiting with our two sons, seven grand children and six great grand children. I guess it was a bit funny -- me, standing there as one of two survivors of my squad with bullet holes in my shirt and a bullet lodged in my boot asking if I was qualified for the badge. 2. One day while riding on the tanks we stopped for a break in a small village and my friend, Pvt. North, and I took off up a side street looking for eggs. - Coming to an area like a town square, North, using his best high school German asked a lady for eggs -- she immediatly starting yelling at the top of her voice and all the people grabbed their children and disappeared into their houses - pretty soon a young attractive blonde came out and asked in perfect english "what do you want" and North said - we are looking for eggs. She -- in a rather haughty voice said -- well, you are asking for children.----- I never quite trusted North's high school German after that. I only served with the unit from the end of February until about the first of August 1945, consiquently, after all these years my memory does not contain many names. The only ones I do remember in addition to Pvt. North was our Platoon Leader Lt. Olson (Olsen), - S/Sgt. Yonkers, squad leader of the 3rd squad, Our fearless B.A.R. man, Poncho (nickname) from Arizona or New Mexico. A couple of others I can still see their faces but not their names. The few pictures I had were made after the war ended, and they were burned in my parents' house fire many years ago. My grandfather was Pvt. First Class Emmett Dangerfield Sr, Company M, 417th Infantry. I have his honorable discharge papers and according to them he was a heavy mortar crewman, he was awarded the EAME with 2 Bronze Stars, Good Conduct Medal, World War II Victory Medal. His battles and campaigns were Rhineland, Central Europe. I'm also listing his military marksmanship information; MM 30.Caliber Rifle, Combat Infantry Badge, 1st CL GNR 30 CAL HMS. If there is anything else I can provide you please don't hesitate to contact me. My Father, Staff Sargent DelMar E. Wilson, was in �First Platoon, Co. B., of the 417th. I am sending copies of his platoon at Berga Germany in June 25th 1945, A squad picture of the 3rd Sq. 1st platoon Co. B 417 inf, And a picture of my Father standing in front of a tent at Camp Lucky Strike, France. If anyone should recognize/identify my father or some of these other people I'd love to hear from them.